It’s always difficult for me to find books in fields that are neither literarily respectable nor popular amongst my friends, since I can’t get recs by either word of mouth or through the major review outlets. Because of that, I often tend to rely on Amazon when I’m looking for crime novels or thrillers or chick-lit or women’s fiction. However, that doesn’t always lead to great results. For instance, I’ve often run across Amy Sohn’s name when browsing through the “Other Books That Users Looked At” tab for some of my favorite books. However, her Amazon reviews are always pretty middling. Usually her books have been two and three stars. And while I know that lots of good books have bad Amazon reviews, I also know that lots of bad books have bad Amazon reviews. And, because of that, I wasn’t really able to get up much enthusiasm for her. At least not until I found an actual physical copy of this book on my roommate’s bookshelf (not creepy–her bookshelf is in the living room) this morning. I started reading it in the morning and had finished it by evening. It was pretty gripping, and I loved it, but I can see why so many Amazon reviewers hated it. In fact, I am pretty sure that most of you would hate it to, and, as such, I wouldn’t really recommend it to most people. 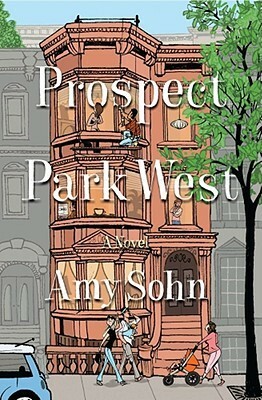 The book is about four yuppie Brooklyn moms whose lives cross paths during the course of one summer. There’s a former lesbian who’s now in a mixed-race marriage; a sexually frustrated woman whose husband is more in love with his daughter than with his wife; a truly deranged helicopter mom who’s desperate for a second child; and a movie star who’s having a slow-motion breakdown. And I won’t mince words. All of these people are awful. Most of them are without a single redeeming feature. This book could, I suppose, be called a satire, except it’s not funny. This is a book about tired people who’re leading hopeless, desperate lives. It resembles Heller’s Something Happened, except it doesn’t have the self-awareness and charm that added pathos to that narrator’s account of suburban entrapment. I really can’t overstate how dark this book is. None of the characters have particularly happy endings. But, even more than that, none of them have happy beginnings or middles either. There is not one single moment in the entire book where someone experiences even a second of joy. But, for some reason, I really liked it. Probably because the book makes you feel things. You’re there, in the grip of the summer heat. You’re there, feeling the dull, exhausted flickering of these women’s anger. And you’re there experiencing the absurd New Yorkiness of it all: the housing coops, and the grocery coops, and the celebrities pretending to be real people, and the real people pretending to be celebrities, and the casual unacknowledged racism, and the constant worry over incredibly minor status markers like what street in Prospect Park you live on. All these things were fun to me.